While programming I have often found myself switching between terminals, debugging and compiling program in one terminal , looking up man pages in other and modifying source code in the other. I have always wished somehow I could avoid this nuisance of switching and juggling between terminals . Terminator is an application that might just solve this problem. 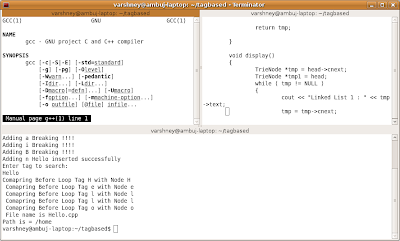 Terminator allows you to open multiple terminal in a single window , each of these terminals are independent of other, and one can easily switch between these terminals by clicking on the terminal you want to use. Terminator is an extremely useful application especially for programmers , or people who like typing in commands , using terminal and shell instead of using GUI. Awesome! I was looking for something like this. why not use screen ? Two Reasons , First of all a lot of people might not know Screen command and other Terminator is bit more n00b friendly compared to Screen. Though , Screen is good!